i was honored to be requested to do a piece for filth^67^AMiSH's e-mag GUTTER. recently my grandfather died. he meant the world to me. i have so many great memories of him growing up. i consider myself quite lucky to have had him in my life as long as i did. 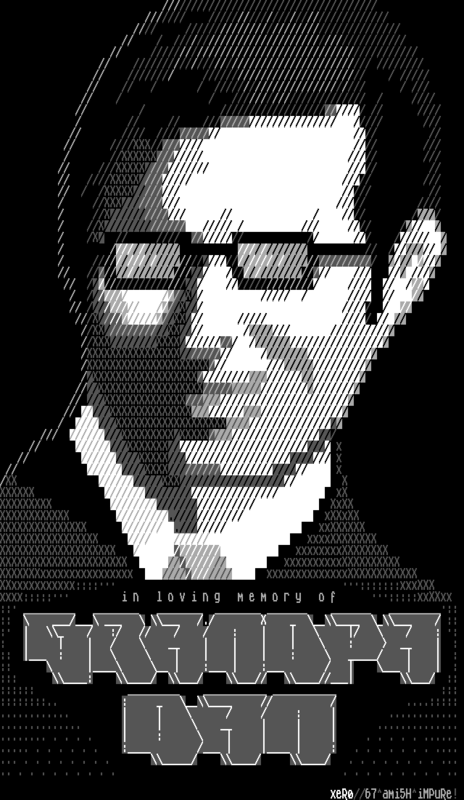 to honor his memory/grieve i decided to do an ascii/ansi art portrait of his younger self. 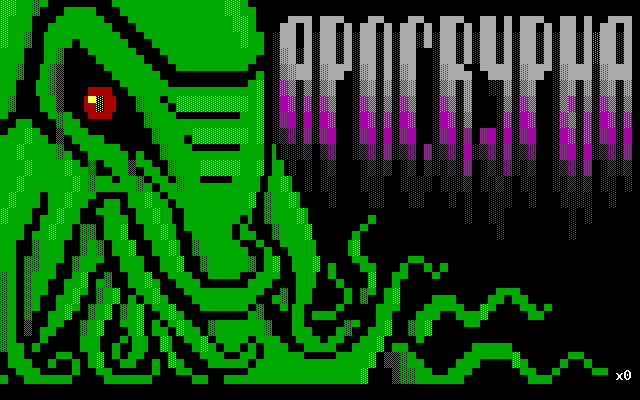 this was released in the impure artpack #67 and was my first time using the microknight AMiGA font. this cthulhu piece was a request from my friend dcat. i released it with blocktronics in their "darker image" artpack. all aboard the impure train! the newest impure artpack #67 has the incarnation of a conversion we had on irc. historically amiga collys are all vertical and lack color. since impure is already viewed as a "modern" crew for releasing in color and files wider than 80 columns... we decided why not make a modern colly?! and what's the perfect subject for a really really wide ansi? a train covered in graffiti of course! last year we had such a good time at demosplash that misfit, filth, and myself decided to do it again! A.M.i.S.H or Ansi Masters In Straw Hats (pennsylvania german: amisch, german: amische) a group of traditionalist ansi artists with pennsylvania dutch origins. they are closely related to, but distinct from, blocktronics, impure and other "english" art groups. the AMiSH are known for simple living, dope ansi skills, and reluctance to adopt many conveniences of modern technology. tl;dr - amish is a joke acronym that misfit and filth came up with in the 90s. but once i met up w/ them we decided that with all three of us representing the western pa area, we should make their dreams a reality! blocktronics is back! this time with a new starwars themed artpack called "detention block AA-23"